As the next generation of SaaS companies achieve maturity, they have begun to serve larger and larger customers, who in addition to demanding a great product, often request services. Professional services, as they are often called, entail training and customization. For product driven startups, the decision to offer professional services is a tricky one. On one hand, the customer is always right and services often enable substantially larger contracts. On the other hand, selling hours to drive revenue decreases the efficiency of the business, by hiring more people in order to grow revenue linearly. As the next generation of SaaS companies achieve maturity, they have begun to serve larger and larger customers, who in addition to demanding a great product, often request services. Professional services, as they are often called, entail training and customization. For product driven startups, the decision to offer professional services is a tricky one. On one hand, the customer is always right and services often enable substantially larger contracts. On the other hand, selling hours to drive revenue decreases the efficiency of the business, by hiring more people in order to grow revenue linearly. In addition, many businesses operate their services divisions at a loss. But not all. The chart above compares the gross margins on professional services across the 13 publicly traded SaaS with the largest average revenue per customer, which ranges from $50-$800K for the 2015 fiscal year where available, and otherwise the last disclosed year before acquisition. 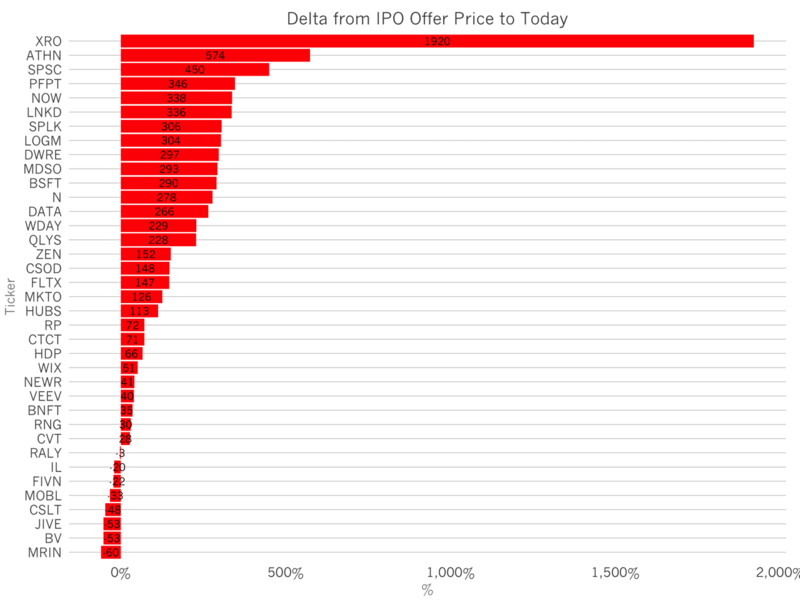 Continue reading "When Should Your SaaS Startup Offer Professional Services"
Of the 43 SaaS companies to have gone public in the time period between 2006 and 2014, 60% are trading above their IPO pop price – the price at the end of their first day of trading. The median company has appreciated 69% since its IPO. The chart above shows the trends for each of the companies in this data set. Xero tops the list that more than 17x appreciation. Continue reading "The Health of the SaaS IPO Market"
Should You Take Cash or Stock to Sell Your Startup? In 2000, the majority of tech acquisitions were primarily stock. One company would buy another using its own shares, instead of paying for the target business in cash. But since then, there’s been a secular trend to cash deals. In 2014, 90% of the tech M&A transactions consummated by companies, and excluding private equity firms, in the US with disclosed deal values were cash deals. As the cash balances of large tech incumbents balloons (Apple is at greater than $30B, Google at more than $65B, Microsoft has $95B, etc), more and more M&A is primarily cash, because cash is cheap and interest rates are low. In 2000, the majority of tech acquisitions were primarily stock. One company would buy another using its own shares, instead of paying for the target business in cash. But since then, there’s been a secular trend to cash deals. In 2014, 90% of the tech M&A transactions consummated by companies, and excluding private equity firms, in the US with disclosed deal values were cash deals. As the cash balances of large tech incumbents balloons (Apple is at greater than $30B, Google at more than $65B, Microsoft has $95B, etc), more and more M&A is primarily cash, because cash is cheap and interest rates are low. The best return on capital then is acquisition or stock buy backs which hit a record high earlier this year. In gross terms, the same story holds true. In 2014, companies spent $22.4B of cash to acquire, compared to $864M in stock. Interestingly, the Continue reading "Should You Take Cash or Stock to Sell Your Startup?" Creating a sense of urgency is one of the most powerful sales tools available to SaaS companies. There are many different ways of accomplishing this, but one of the most common ways is to offer discounts that expire. Discounts are powerful incentives to increase sales. But, they have to be crafted correctly, or they can have dramatic impact on a startup’s cash position. This is why sales incentives should be designed hand-in-hand with the company’s finance team. Imagine a hypothetical 20 person software company. Suppose this month is seasonally slow month, and the executive team decides to implement a 25% discount to accelerate sales. There are many ways of offering this discount to customers. Above, I have modeled three: a 25% reduction billed monthly, a 25% reduction billed upfront, and the first three months of the subscription are free. Each of these options costs customers the same total amount over Continue reading "The Risk Sales Discounts Impose to Startup Burn Rates"
Traditional software was initially sold by perpetual license. Then in the mid-00s with the advent of SaaS, the market shifted to per seat per year pricing. And simultaneously, freemium marketing strategies blossomed. Freemium companies provide software for free temporarily to entice users to try and use the product. Eventually, these users cross a threshold and convert to a paid subscriber. This threshold can be based on number of people using the product (Expensify), number of documents signed in a month (HelloSign), or additional product features needed by users (Yammer).